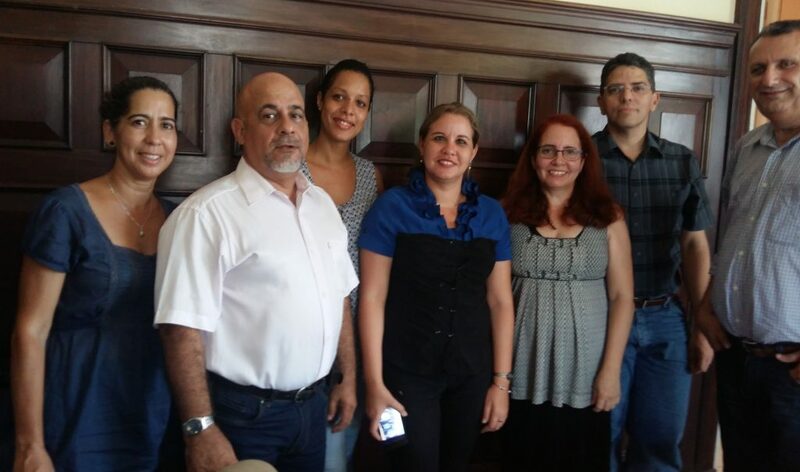 On August 8, 2018, Obrador Ediciones, a member of the CCICC, met with representatives of the Cuban Book Institute (ICL) to establish business and professional links. The meeting took place at Centro Dulce María Loynaz in Havana, the Cuban capital. In the meeting, the collaboration between the two institutions to establish links on topics of common editorial interest was highlighted. Following the meeting, it was agreed to sign an agreement that will outline the guidelines for future collaborations between the two parties. The collaboration between the two institutions is part of the implementation of the Québec-Cuba 2018-2020 Action Plan, which defines the main interests and actions to be taken to advance in the commun cooperation in various sectors, including culture. In the photo, from left to right, the participants in the meeting: Iyaimi Palomares, director of the publishing house Arte y Literatura; Juan Carlos Santana, Editorial Vice President of the Cuban Book Institute; Jane Denisse Coloma, Representative of the International Relations Department of ICL; Sandra Sarmiento, Commercial Vice President of ICL; Yaikel Águila and Ariel Pérez, Representatives of Obrador Ediciones; and Hermes Moreno, director of the publishing house Nuevo Milenio.